Sooo, I think I’m going through a ‘harissa’ phase at the moment. I seem to be adding it on everything! Especially broccolini, along with organic ghee and sea salt. SO good! The other week I baked some chicken in the oven and added the same ghee, harissa and sea salt combination. It was super delicious, and now it’s Mike’s new favourite chicken recipe, and one that I had to share with you all! Since I’ve moved into my new house (very exciting) I’ve been busy testing out my new Miele oven. It has a dual oven and grill cooking function, perfect for baking the outside of the chicken nice and crispy, while at the same time cooking the fat out of the skin. I’ve also found that baking the chicken with the skin on helps it stay tender and prevents it from drying out. Today I’ve simply served my chicken with fresh rocket and goat’s cheese, but feel free to serve it with anything you like; roast vegetables or your favourite salads. I’ve also included a few links below to recipes that would work perfectly alongside the baked chicken. Line a deep baking tray with baking paper. With the back of a spoon, spread the ghee along with half of the harissa paste over the baking paper. Place the chicken skin side up into the tray, on top of the ghee and harissa. Spread the remaining harissa paste over the top of the chicken with the back of a spoon. Sprinkle the chicken with a generous amount of flaked sea salt. Pop the tray into the oven and bake for about 35 minutes until golden brown and cooked through. Test that the chicken is cooked all the way through before removing from the oven. Once cooked, remove from the oven and let rest for about 5 minutes. Pour the pan juices over the chicken and serve with your favourite salad or roast vegetables. 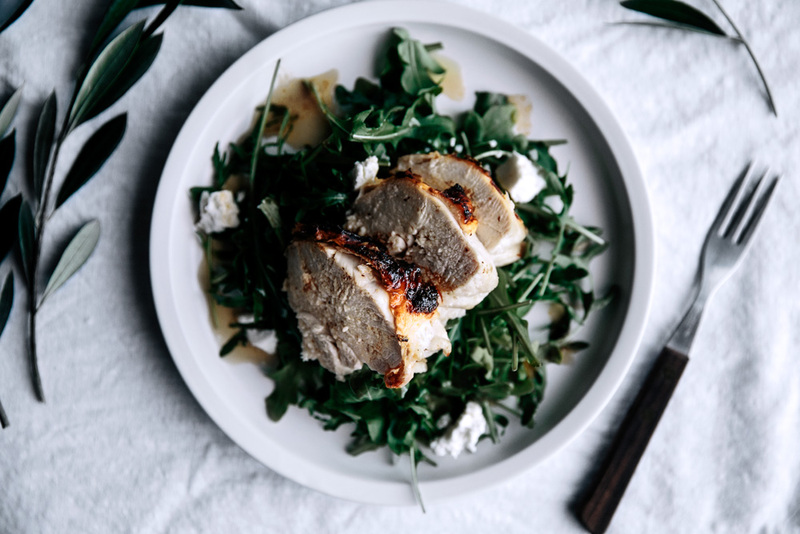 In this recipe I’ve served my chicken with fresh rocket and goat’s cheese. NEW and IMPROVED quick and healthy Christmas pudding!